When bmw issued the 2800cs in 1968, road track called its engine without a doubt the most efficient and sophisticated in-line six in the world. in 1971 bmw introduced the same karmann-bodied notchback 2 + 2 coupe with the engine bored out to three litres. 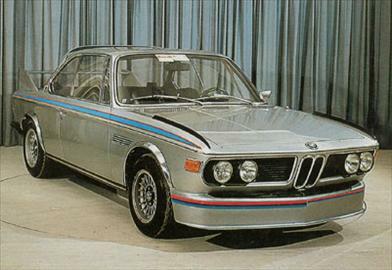 With fuel injection this 3-0 cs became the 3.0 csi, and with an ultralight body it was the 3.0 csl. Faster with fuel injection the 3.0 cs matched the 2800cs coupe with the running gear and suspension of the big bmw three-litre sedan. Bosch electronic fuel injection, a higher 9.5:1 compression ratio and adjustments to valve timing raised hp to 200 in the csi. The stroke was lengthened in 1973, increasing engine displacement to 3,153 cc. the awesome batmobile the star of the series was the 3.0 csl, which had wider wheels and weight-reducing aluminum-alloy doors, hood and trunk. This model received fuel injection in 1972 and the 3,153cc engine in 1973. When equipped that year with an optional front air dam, rear-window spoiler and tailfins supporting a wide rear aerofoil, the 3.0 csl was dubbed the batmobile. in 1974 this car won the european group 2 touring-car championship. The bmw 3-0 csl was a fast lightiveight sports coupe dubbed the batmobile when equipped with a front air dam and rear aerofoil.